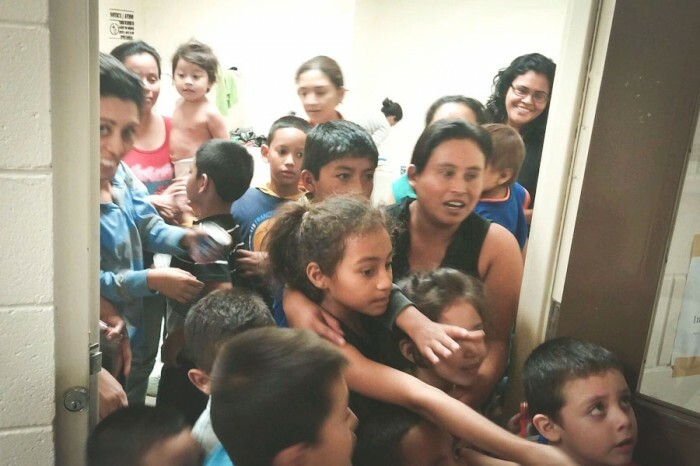 Many of us having been reading and hearing stories about the wave of children and youth from Central American who are crossing over the boarder into the southwest of the United States, many of them unaccompanied. But First Church member Jennifer Fisher has taken the next step—encouraging our congregation to take concrete action to address the needs of these young immigrants. And she will get in a truck full of supplies and drive if that is the right thing to do. Jennifer’s desire to respond has been galvanizing and a meeting has been set up for Wednesday, July 16 at 7:00 pm in the Sunburst Room. Anyone who is interested in learning more about this challenging situation and to discern the best way for First Church to respond are invited to attend. This wave of immigration has excited strong feelings. I heard on the radio that at one rally protesting the arrival of these children a woman held a sign that said “Not our children, Not our problem.” I must emphatically disagree. Jesus clearly calls us to care for the hungry and the thirsty. We are all neighbors and when our neighbors are in need, we are called to act. Join Jennifer and I on Wednesday night and be prepared to respond to a special call for funds to provide relief for at least some of these children. Last Sunday, a photograph of Trayvon Martin and a “hoodie” were placed on the communion tables at both services at First Church. 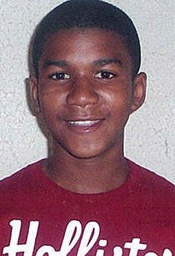 Trayvon was a 17-year-old African American who was shot by a neighborhood watch captain in Florida. The man who shot Trayvon was not arrested based on his claim that he fired in self-defense. Public attention and outrage has grown steadily in the month since the shooting. This case has touched a nerve for many, inviting us to look not only at instances, but at patterns. This situation is not just about the tragic death of one young man. It is about perceptions of young African American men. Though some may see the murder as out of the ordinary, many are seeing it as something that could easily happen to them or someone they love. Thousands upon thousands of parents are now even more concerned and apprehensive about the safety of their sons. “Always pay close attention to your surroundings, son, especially if you are in an affluent neighborhood where black folks are few. Understand that even though you are not a criminal, some people might assume you are, especially if you are wearing certain clothes. Never argue with police, but protect your dignity and take pride in humility. When confronted by someone with a badge or a gun, do not flee, fight, or put your hands anywhere other than up. Trayvon is both a victim and a symbol. The tragedy of his death stands alone, but as we mourn him, we are also mourning many lives lost. We have an opportunity to stop and call ourselves and our culture to account for the ways that young lives are cut short or derailed because of race or class. One of the things that church can offer is a place where the family is extended. In so many ways, teenagers and their parents need the support of the wider community. We can help hold the lives of our young people during a period that is often fraught with challenge. Perhaps Trayvon’s death can spur us to take even more seriously our opportunity to spread our collective wings over our young ones—those right next to us, those we pass on the street and those we only hear about through the news. These words were spoken by First Church member Kevin Omi at an Axis of Friendship event held at the time of the commemoration of the 10th anniversary of 9/11. The event honored relations between people of the United States and Iran and celebrated connections with people of all cultures and nations. I am a member of First Congregational Church of Berkeley, a progressive Christian congregation serving the East Bay. In church this morning, Dr. Rahim Nobahar, the new Imam of the Islamic Cultural Center of Northern California, was our special guest for our 9 am service. Amir Soltani who has visited with us several times, read poetry in our 11 am services. 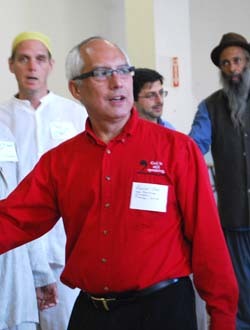 This July our denomination declared its support for our neighbors in the Muslim community, both in the United States and around the world, who feel the impact of anti-Islamic rhetoric and action. We agreed to denounce actions against Islam or Muslims based on ignorance or fear; and to learn more about Islam and to build relationships with Muslims and peoples of all faiths. I am also a Japanese American, the proud son of soldier in the 442nd regimental combat team. The 442nd was the most highly decorated regiment in the history of the United States armed forces. My father fought in some of the most brutal battles of WW-II while the rest of his family, along with 110,000 other Japanese Americans were stripped of their belongings, property, and dignity. Some were forced to sleep in horse corrals in Tanforan before they were sent on trains to the most desolate parts of the county. They lived in concentration camps surrounded by barbed wire, in tar paper shacks, during brutally hot summers and freezing winters; because of wartime hysteria and a long history of racism against persons of color. Japanese Americans have been among the most vocal and passionate supporters of embattled Muslims. When we heard talk of “rounding up Muslims”, we immediately saw the potential parallel with our own history. We have folded thousands of paper cranes, which are a symbol of peace and decorated the windows in an Islamic school in Sacramento. We have rallied public support against hate crimes at mosques, signed on to legal briefs opposing the government’s indefinite detention of Muslims, organized cross-cultural trips to the Manzanar internment camp memorial, and held “Bridging Communities” workshops in Islamic schools and on college campuses. As a member of the United Church of Christ, I believe that God is still speaking and urges us on to work with people of all faiths for the causes of peace, justice, and love. As a Japanese American, I stand in solidarity with Muslims and all persons who are the object of suspicion, ignorance and fear. Thanks be to the God that unites and sustains us. On Sunday, September 11, 2011, First Church will commemorate the 10th anniversary of the tragic events of 9/11 in a variety of ways. These events have changed the landscape of our country and the world. We stand with those who still grieve their losses, with those who were shocked and traumatized by these events. We also grieve the loss of life and limb that has occurred in the wars that have been fought since then in Iraq and Afghanistan. As people of peace, we must lift up the futility of war and the seeking of vengeance. We also stand against the demonization of individuals, groups and countries. Even as we claim our loyalty and love for our country, we also claim our global citizenship. All of us are brothers and sisters, even as we sit across the divide of nationality, religion, or conflict. One of the outcomes of the events of 9/11 and the ensuing political and social turmoil, is that we have reached out hands of friendship to people of other faiths and are richer for these new connections and new understandings. On this special Sunday, we will commemorate 9/11 in both worships services, welcoming guests from the Islamic Cultural Center of Northern California, a mass choir will sing Verdi’s Requiem at 3 pm in the Sanctuary, and in the evening we will take part in an Axis of Friendship event at the Oakland Peace Center. FCCB says “Imagine another world is possible.” Imagine it. I had recently donated to the United Nations High Commission for Refugees for Somali refugees. Then on Sunday, July 31, I saw Phil Porter’s video of the “Loaves and Fishes” story at First Church. It told the old story of Jesus feeding the 5000 in pictures and words. I was so inspired, and I felt the need in Somalia so deeply that I decided to give $365 to this every pay day for the rest of the year, because I can. If we each do what we can the hungry will have food, and clean water. In one week, UNHCR moved 5000 refugees to safety and is supplying food. Feeding the 5000! I chose UNHCR because they are already mobilized, already committed, and large enough to reach so many quickly. So when I imagine another world is possible, I know it can be. Let’s get a million to give. Spread the word and we can make it happen! Read more about the situation in Somalia. Here are the words to “Walk on Water” a song by Phil Porter and Elaine Kirkland that was sung during the Sunday service on August 7, 2011. Phil also preached a sermon called “That Sinking Feeling.” You can read a condensed version on this blog or view the video of the service. But now I’m lucky just to float. might make my life capsize. But rainclouds fill the skies. a boat in heaving seas. That’s right before my eyes. And part the waters, too. 5. But now I see my folly. I’m trying much too hard. why pick a task so tough? © 1990, Phil Porter & Elaine Kirkland. All rights reserved. So few things are true for all of us. But I would guess that we have all had that sinking feeling. Worries, doubts, regrets—large and small. The flutter in our gut, a dark cloud obscuring clear thought, a nervous rush that tingles all the way to our fingertips. Don’t we long for someone or something to reach out and take our hands and pull us out of the murky waters? Jesus did that for Peter. He grabbed Peter’s hand and together they walked back to the boat. The wind ceased and the waves quieted. Isn’t that part of what community is about? We reach out to each other in times of need. We are pulled back into the boat or help someone else clamber in. Isn’t that part of what prayer is about? We try to quiet the rampaging worries, we breathe deeply, we look for a deeper truth and a more stable center. We ask for help from a source greater than we can imagine. Isn’t that what Jesus is about, a man who was of a time and place but also transcends time and place? If Jesus could be there for Peter and the rest of the panicking disciples, could he also be there for me? Isn’t that what communion is about? We gather around a table and share food like a family. We take sustenance to use when we need it and we almost always need it. Let’s take hands. Often. 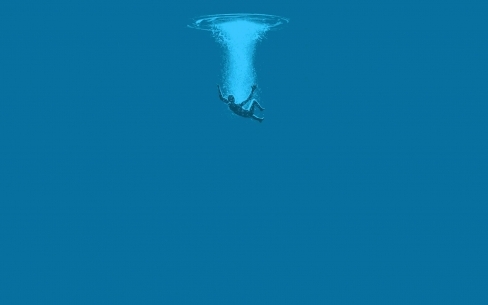 That way, even if you don’t know I have that sinking feeling, you may be pulling me out of the troubling waters. Together we will get back in the boat, the winds will cease and the waves will quiet. More about First Congregational Church of Berkeley.